If you feel like a change from Windows, the obvious answer is to try Linux. But there are literally hundreds of variants available, so it's difficult to know which one to try first. Among those coming from a Windows background, Zorin is rapidly gaining followers because it deliberately tries to resemble Windows in order to feel familiar to existing users of Microsoft's OS. Zorin is built on the well-known Ubuntu flavour of Linux, with additional themes and tweaks. There's also a Look Changer app, that instantly changes various settings in order to make the user interface resemble either Windows 7 or XP. Zorin version 11 was launched a couple of weeks ago, and it's free to download and use either the Core or Lite versions. There are also Pro and Ultimate offerings, which cost around $9, but Core should suit almost everyone. It is, though, a hefty download of around 1,500 MB (1.5 GB), so beware of downloading it unless your internet provider is generous with their monthly bandwidth allowance. The download is in the form of a .ISO file, which you can either burn to a DVD disk or use to install in a virtual machine using a product such as VMWare Player. This, too, is free for non-commercial use. Or you can install the DVD on a spare PC if you have one (a laptop is just fine). Zorin is way too large to scan for malware with VirusTotal. However, because it's an entire replacement operating system anyway, the chance of it infecting your existing system is zero. Which would best suit the above ? Can anyone point me to a good article for placing it on a USB Thumb drive ? Rob - it sounds as if you are in exactly the same situation as I was: using XP and Win7 on old-ish laptops, and wanting a light-on-resources and easy-to-use Linux alternative. 5) My advice would be - read up and research first. There are lots of good reviews on the internet. I would also add, try the Linux distros that are fairly well-established and long-running, and which have a good user-community and forum (most Linux users are both enthusiastic and helpful). Some distros have a limited shelf-life, a small user community, and flourish for a while then disappear. Some (ArchLinux?) are complicated and mainly for serious geeks. 6) So what about my personal choices? YMMV. I found Zorin easy to use but a bit gimmicky, and it is still a fairly new distro (with a helpful user forum). I didn't like the Ubuntu "Unity" desktop (which is more like Apple's Mac, and unfamiliar to XP/7 users) - and I found the various Ubuntu forums too geeky and technical. I tried LXLE because it was lightweight, but I didn't like its desktop. I have ended up using Linux Mint with the XFCE desktop, and I also use Linux Lite. Both have outstandingly good forums with helpful users who talk in plain language. My third choice is PCLinuxOS, a well-proven rolling release with again, a dedicated user-community. Whatever you choose, good luck. You will be surprised at how quickly you adapt to Linux..... and pleased at how much more satisfying than XP or Win7. There are so many possibilities to choose from and of course everyone has their favorites. The good news is most can be previewed using a live session DVD or USB drive. You will find instructions for doing this easily enough via the chosen distro's own documentation or from links in their forum. There are YouTube video tutorials covering most distros too. Using a live session will enable you to play around with the included programs and settings and doing so will also show up any possible incompatibilities with your hardware. There are two distros in particular others will no doubt chastise me for not including but based on my own experiences I would recommend to look at Q4OS, MX-15, Zorin Lite and Peppermint. Windows users often moan about the learning curve associated with moving to Linux, yet they manage to master a smart phone well enough. :) In any case, I'm sure you will find it time well spent. Our own Linux forum will offer support if you need it. MC - Site Manager. Hi all, until 15th December I was a Windows 10 user after having been Window8.1 user, and was disillusioned with the niggles and and all the problems with data mining etc. I did try Zorin which was OK but did not like their annual upgrades or the fact of the distro is based the very outdated Ubuntu base. I am now running Linux Mint 17.3 Cinnamon 64bit LTS and have found that it suits my needs superbly well and enjoying using it. Looks Like I should try Zorin again. Years ago (about 2?) I tried it on a decommissioned 2.4Ghz i3 with 4GB ex Vista 64bit HP computer and MAN, was the box SLOW! It was installed, not running from a USB stick! I immediately discarded it in favor of Linux Lite which still happens to be my favorite LTS Windows alternative. Windows users can shrink their drive to create some free space and then dual-boot a Zorin installation into this, choosing which system to use at boot. Alternatively (my preferred option and safer) you can wipe Windows completely, install Zorin as the main operating system and then re-install Windows into VirtualBox. 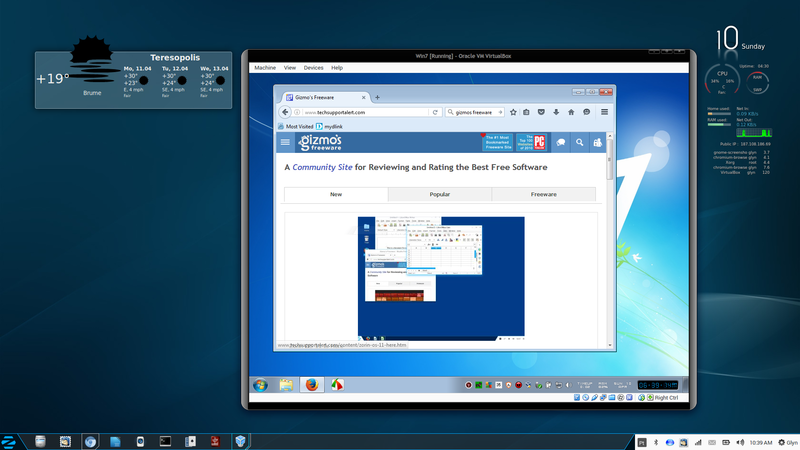 Here's a screenshot of Windows 7 running as a guest OS on Zorin 9 inside VirtualBox. MC - Site Manager. The idea of moving to Windows 8 or 10 from Windows 7 didn't appeal to me, so I looked at Linux options. I considered Zorin and tried it for a while. It was attractive, but a bit "gimmicky" - and I did not feel I needed the various visual options, many of which were quite resource-hungry. To cut a long story short, I have ended up with Linux Mint XFCE as my first choice, with Linux Lite as a close second. Both run fast and flawless on my not-very-high-powered laptop. I did not want to abandon Windows 7 completely (it remains on my laptop as the original OS) as I still use some software that was designed for Windows. For those thinking of switching, there are easier and less radical options than wiping a Windows install completely. It is always possible to try out any Linux distro in a "Live" session, by downloading it as an ISO image and running it from a CD or DVD - this will run a bit slower than a full install, but allows the testing-out of wifi and similar features. But there are better ways of having the best of both worlds (Windows and Linux). It is possible to install any - or several - Linux distros on an external hard drive, and then use the BIOS boot options to choose whether to boot from the Internal (Win7) hard drive or the external (Linux) drive. Alternatively, partition the internal drive and set up a dual boot with Windows and Linux. For those who are unhappy that this replaces the Windows bootloader with the Linux one (aka GRUB) there is a further option: use EasyBCD, a software program that installs in Windows and enables the booting up of other OSs without losing or modifying the original Windows bootloader. A further joy of Linux is that it is possible (and not difficult) to run more than one distro - and also continue to run Windows - and to have all your files/folders/documents/pics etc saved in a shared partition which can be accessed by whichever OS you happen to want to use. Finally, whichever Linux distro(s) you prefer, I echo the advice given in other comments: choose a version which is based on a Long Term Support (LTS) release of the underlying Linux OS architecture (Ubuntu or whatever). Or go for a Linux distro which is a "rolling release", such as PCLinuxOS, which in theory should seldom, if ever, require reinstallation in order to upgrade as it is constantly and continuously updated. Zorin 11 came out on Feb. 3, and it's based on the old Ubuntu LTS (has Linux kernel 4.2.0). Okay, that won't mean much for noobs, but it does lag quite a bit, even more than Mint. It's pretty, and does look like Windows (or Mac, if that's how you roll) but there are more cutting edge beginner distros, like Ubuntu MATE. I put it on my dad's PC (he's 94); it works like a charm. Things are easier to find in a menu, so you don't have to clutter up your desktop with shortcuts. It's #11 on the distrowatch list, so it's pretty popular. I would recommend waiting if you do want to install this. 11 is based on Ubuntu 15 which is not an LTS release. When Ubuntu 16LTS drops here soon Zorin should follow. Thanks for this heads-up. Will definitely wait.. I agree. Security updates for V11 are only up to July of this year. I still have Zorin 9, the current LTS, installed on one system and this will receive updates until April 2019. MC - Site Manager.